I had been simultaneously sweeping the floor, boiling potatoes, and returning a text message to a friend when I heard the truck coming up the driveway. We have a gate and a long driveway, so it is rare that a car other than our family’s pulls up unexpectedly. It was already 6:00 PM, but this was the FedEx man, delivering a package for my son. But wait, let me back up: Moments (ok seconds) before the truck drove up, I confess I was in a bad mood. I was feeling irritated. Irritated with the daily clutter and messes that come with raising (and homeschooling) four boys. Four beach-loving, active boys. I prefer things to be tidy and orderly, and I don’t think that’s too much to ask. But even when everyone is pitching in, it’s hard to keep up. And yes I’m thankful to have healthy, busy kids, and happy that my kids are around so much, but sometimes I wish they didn’t leave so much “evidence” of their presence. So I stepped out to greet the FedEx man, who smiled widely and reached out to pet our dog. I had the urge to apologize for the dirty dog (he was touching her) but stopped myself short. It’s a dog, we live in the country. It’s ok. I signed for the package, said thank you, and turned to walk up our front porch steps when I actually noticed the front porch!! and: Forget the dog, the whole place was a mess! 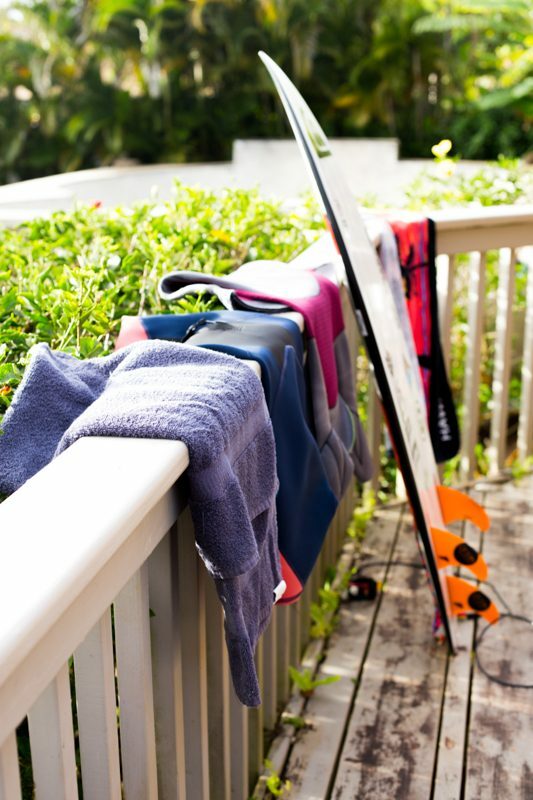 Wet suits hanging from the rails, coffee mugs on the table…kids’ surf and diving gear strew about, even a pair of little boy underwear literally draped over the back of a chair. 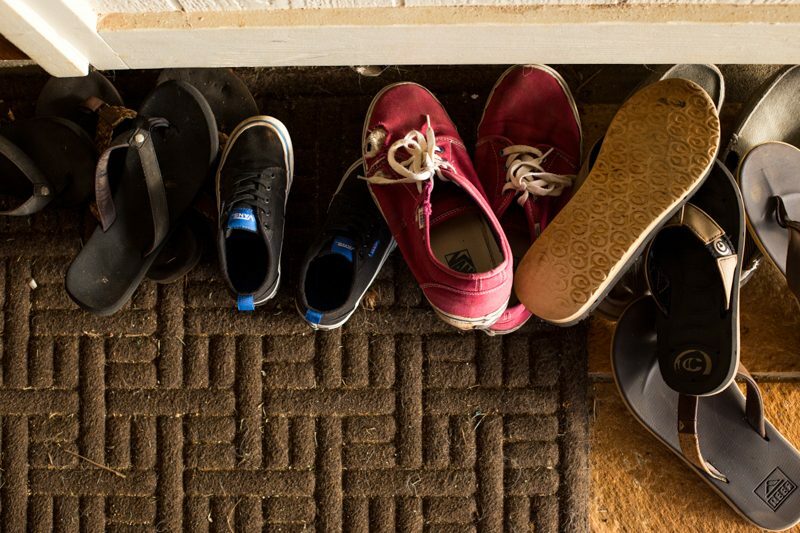 And of course shoes (slippers around here) piled up in front of the door. Wondering if the FedEx man had noticed, (hoping he hadn’t) I looked over my shoulder to see that indeed, he was still standing there tall, in the big open sliding door to his FedEx truck, looking right over me at the entire scene. I stopped and looked at him and he just looked out, like he was surveying our home or something…Not in a creepy way, but with a smile and a satisfied sort look on his face, like he was taking a mental snapshot because something about it made him happy. I realized in that moment that everything before me…all of the stuff that I was embarrassed about and wanted to apologize for…they were the most awesome and precious and wonderful signs of a life being lived now. In the present. Not yesterday or next year. Not a memory, but today. Now! And right then and there — as if someone had switched out my frustrated-mom-brain with a wise-older-lady-whose-been-there-before-brain, I felt completely content and even proud that this was my home. My mess. My signs of life! Suddenly then I wondered if the FedEx man had a family or a dog or someone to drink coffee with on the deck. (I also can’t explain why I have thoughts like these but) Do his kids leave messes and does it stress out he and his wife? I thought that maybe he knows how blessed we are when we have kids and messes, and maybe that’s why he smiled the way he did. I actually choked back a tear then (please know me well enough to know that I don’t write this stuff to be sappy or emotional but this is really the truth) because I remembered that saying — the one that the older, wiser women tell us moms who are in the thick of it…”These are the days” they say. And I’ve heard it a million times but I knew it was true then. These are the ones…the very, exact days that we will one day sit and close our eyes and try to remember — the way we try to remember the taste of a favorite meal, or the smell of our babies. This! This here and now and sandy and messy and the underwear on the chair — it’s the stuff that one day I’ll only dream of having the chance to revisit. Even just one more time. I turned back to the house as I heard the truck slowly pulling out of my driveway. Making my way back inside, I felt like a completely different person than the one who had walked out. Grabbing the coffee cups and the little boy underwear (stiff from having been in salt water and then dried) I headed inside to finish tidying up and preparing dinner. It all still needed to be done. But now my feet were light on the floor and my heart soared because for at least that moment I knew that these really are the days. These are the loud and the messy and sometimes the hectic, but these are the days that say LIFE! so loud and clear. And I don’t want to wait to be old to be wise. I want to live today well. Even as I keep trying to create order out of the disorder, and find peace in the noise, (because I’ll never quit trying!) I want to know that these are all beautiful signs of life. And somehow knowing that changes everything. And before you apologize to your friends or guests, (or the FedEx man!) be reminded that a life well-lived will always be a bit of a beautiful mess…and welcoming others into it is sharing life in the most authentic way. I’d love to hear about your current signs of life, so feel free to leave a comment below. And if this post has encouraged you, please consider sharing it with your people by using the social share buttons below! PS All of the (yay–brand new!!) family photos were taken by my friend, and super talented photographer, Laura Aguon. One of the best quote I have read in a long time “a life well-lived will always be a bit of a beautiful mess”. Thank you for that perspective. WHOA!!! I can’t believe how timely your post was for me today! I struggle with never ever having my house look like it’s from a catalog page but always with “signs of life”. I need to internalize that… Thank you for a great reminder. This post really shows how in some way or another, everyone has the same everyday struggles! At our house with our big family, the house and yard are always in a state of disaster. I thought we were the only ones who had this problem, It is so wonderful to hear we are not! With small children everywhere, you clean one half half of the house, while they mess the other half, it get’s really frustrating! greetings! Yesterday I had a total melt down, I was R.A.W (rattled. authentic.weary) red eyed, vulnerable, tears streaming down my face, distress choking my throat, soaking wet and wrapped in a towel standing in the shower when my son poked his head in the door to check I was OK. One look told him I was not. And you know the crazy thing that unleashed the blubbering beast. . . ? A toothpaste wrapper found on the shower floor! No I mean seriously. . . There is a bin right beneath the sink for such matters but no, that would somehow be too much to ask. . . Of course when I told my son the cause of my breakdown he apologized immediately and put it straight in the bin, but I could tell he was secretly thinking what’s the big deal and he’s right! Needless to say I spent the rest of the day in bed (something I never do, so this was SERIOUS!) wondering whether I was a complete mothering failure or just totally losing the plot!
. . . and of course your post which could not have popped up at a more needed moment. I look forward to embracing this fresh outlook as I navigate the signs of life with my teenage twin boys. Dear Monica. Himanshi this side from India. Read your post early morning. I want to thank you for posting this at the right time. Seems like it’s just for me. Yes we have umpteen signs of life here in our home. We have recently adopted a puppy who is undergoing potty training. My 10 yr old son loves craft and origami and Lego. Every paper is strewn all over the house folded into a figure and there are Lego creations every nook and table. Then a 17 yr old teenager who is no better. The boys room looks like some earthquake has come. I am busy cleaning up all day. All three of them leave a mess behind. But as you say, these are signs of life. Our home is happier. I am grateful that we are healthy. We smile more since the puppy has come into our lives. I love you for sharing this. Have a grt stay at Tahiti. All the best for everything. Thank you so much Himanshi! It is great to hear from you and indeed, it sounds like you have many signs of life in your home!! 😉 It’s so fun for me to think of you way across the globe from me, but still dealing with the same stresses and same love…Much aloha to you and your family as you continue to embrace this season! What a wonderful reminder!! Though I only have 1 left at home now (his room definitely shows “Signs of Life” so I can’t complain there!) I do miss having the other kids at home who are now grown and out of the house. I reminisce about days long gone and remember at the time how frustrating and annoying it was to have to clean up messes and chase after kids. But honestly, now that those days are over with, I soooo miss them. I miss the chatter, the laughter, the busy-ness of life with young and teenage children. It is only now, with my youngest and quietest child, am I learning to live in the here and now and focusing on the present. After a busy weekend (for all of us) I literally just told him to clean up his room and make his bed – now, I will tell him “don’t worry about the 3 different backpacks left on the floor (2 different sports and school). It’s okay if I trip over them; and don’t worry about the unkempt bed; and the dishes of food left on your desk. At least I know you’re still here… under my roof… with me and your dad.” In 4-5 short years he’ll be gone to college and these will be memories. It’s up to me whether or not I want to remember them as just as additional annoyances (“Oh, he could never keep his room clean. I had to tell him over and over again, every day to clean it up!”) or look back on them as fond memories. Again, thank you for your positive post. It definitely hit the spot at the right moment! ALOHA! More than once this week, I have been reminded of the verse in Proverbs – “where no oxen are, the crib is clean”. And while there are definitely days I wish our “crib” was cleaner, I’ll take my rambunctious happy healthy boys over cleanliness any day. Thank you for the reminder to appreciate these days while we can! Thank you for your honesty and reminding me how fleeting these moments are. I become focused on my still “to-do” list and lose perspective. This is a sweet reminder of life happening. You just made me see something differently. The fact that my strong-willed 17 year old son’s room is a complete disaster is because HE is living there. And that is a sign of his life. Thank you. Now I can calm down. I have 4 kids— 10 and under. Their mess often makes my blood boil as I’m the main parent taking care of them temporarily. It’s a lot, but I plan to have lighter feet as I work. These signs of life are precious and I pray I’ll soak it all in while it lasts. All dishes were put away, hahaha… except the ravioli and red sauce. It just made me chuckle and laugh! And then, I read your post – what timing! So classic, Becca. Truly love that story. Have a great day! Have a great day as well, Monica!!! Thanks for keeping it real! Love connecting with people who strive for an authentic and balanced life! We’ve been talking about this SO MUCH lately! 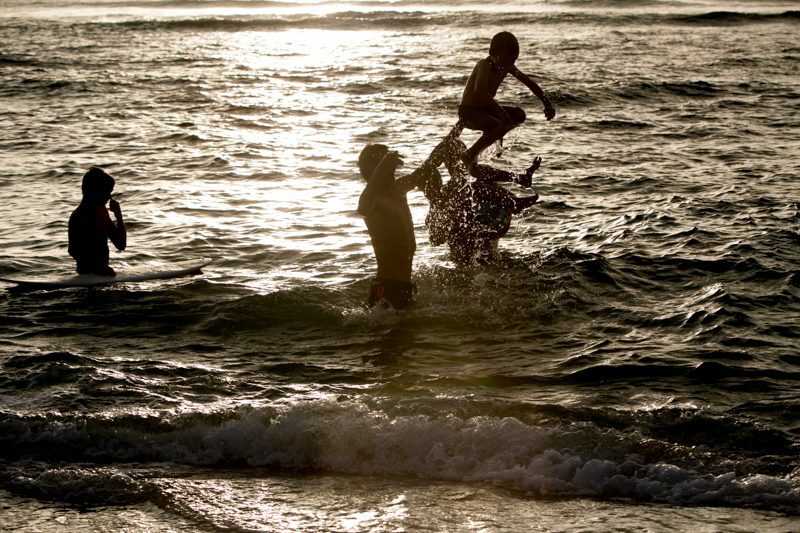 About how people older and wiser than us tell us that we’ll miss this some day when the kids are gone. My husband and I look at each other – not this phase. We’re not going to miss THIS phase, surely?! I already miss the time when they were younger, toddler and baby – even though I thought that was SO HARD (I just had no idea what that really meant). I miss when they were 6 and 9 even though we were busy and the house was always a mess and things are always difficult for their own reasons. But this phase? No way. There’s no way I’m going to look back at this season of our lives and say, “Do you remember when the boys were 10 and 13 and I cried myself to sleep every night? I’m so sad they’ve grown up and gone.” But maybe, I guess. Maybe having them here at all is better than not, no matter what… Maybe it won’t be laundry on the railing that I’ll be able to look back at with a certain reminiscent nostalgia but just having them home will be enough. I really hope so. Three of my five children are now adults, and we only have a teen and a tween at home. It is a lot easier to keep things clean these days. After reading your post, I asked my husband with some nostalgia, “Is our house too clean because we only have two kids left at home?” It’s better when all the kids are home. My oldest son turned 13 this past weekend and I want nothing more than to slow down time! I remember when a salesman for an alarm company was in my home. I had to show him the entire house so he could get an accurate estimate for me. We walked into the basement/guest bedroom/laundry room and piles of laundry were ALL over the floor. I immediately apologize for the mess and he responded with the most gentle and reminiscent smile and said that he and his wife could only wish for piles of laundry on the floor, his children were now in their 30s and on their own. That was 5 years ago. I never installed the alarm system, but clearly the moment was very meaningful for me and I completely understand your Signs of Life. Because if there aren’t signs of life, then there is no life. I appreciate how so many of your posts speak to my soul. Thank you. Thank you for this article. Although my children are adults with homes of their own, your insight made me rethink the mess my husband makes in our garage. Many nights each week have cars from other people in our driveway waiting for my husband to fix. He does this not only because he enjoys it, but to help others and make a little spending money. One day may come where I will miss his dedication to our budget and him always being busy, to the point of falling asleep almost as soon as he finally sits down. One day the house will be too quiet. “It doesn’t matter how big or clean the house is. But how happy the home is :)” saw this somewhere. Can’t recall where – but I loved it and now I love your “signs if life”. Totally relate. I struggle to shake the military white glove like clean orderly household my mother ran and keep it real for my 2 amazing healthy crazy active boys. I want to be more focused on the moment and not the clean floors! Coming from a different point in a mom’s life: I am a 50-something empty-nester. I can vividly remember my son’s toys strewn all over the living room floor when he was just a toddler and thinking the very same thing. “One day I will wish for days of toys strewn all over the place,” That day came a few years ago…Oh how I miss them. I could easily get emotional too, when I think about it. Now, my hubby and I are in a different phase of our lives…the house sometimes seems so empty with just the two of us living here. My honest to goodness advice: soak up those days of seeing “signs of life”…they pass by way too quickly! ok…so now I’m crying…thanks Monica. (No…really…thanks) I needed this today. After working all day and coming home to nothing being done by my husband and 2 sons while I slaved:) Signs of life…a 17 year old and a 16 year old. The day they flee the nest ascends upon me. I try to savor each and every moment. Even when it’s messy and hectic. These boys, Chase and Chad…are my world. Bravo Monica! Now, that I’m an empty nester all three kids away from home, I miss those messes and all the noise. You’re fortunate to have noticed it NOW, before it’s all gone. I have a clean and tidy house most days now, but I long for those messes and the laughter, and noise. 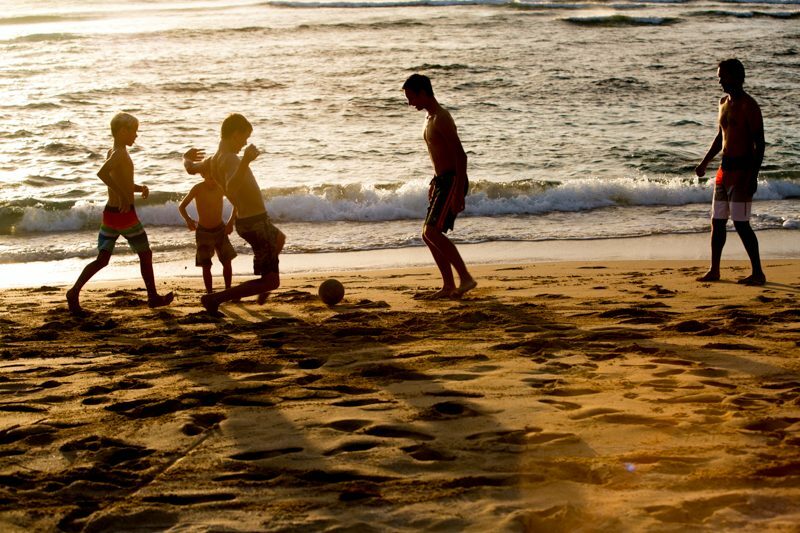 Mahalo nui loa for the memories. I hadn’t opened “Feedly” in a few days, so I was behind on your blog. God knew; He knew that last night (to be honest, it has been building up for a few days), I was feeling completely done with the “daily clutter and messes”. Why, oh why, the boys (5 of them) cannot just use something and put it away? How can they seemingly NOT see the disorder? It will be a daily striving on my part to keep my house clean, but more importantly to be GRATEFUL for the greatest gifts God has given me. I can’t be tempted to do it all for them, but to cheerfully ask them each and every time to clean up their own mess and to help each other. Thank you!!! Rachel, so glad the timing was good here! Bless you–you have a high calling raising five boys, and no it is not simple or clear…Your heart’s desire (an orderly home) is not wrong! It’s such a balancing act…Hang in there and thank you so much for letting me know this encouraged you. XO Aloha! My twin boys are 10 months, current signs of life at my house, lots of toys, toys everyday, empty baby bottled and a lingering scent of baby powder. Thanks for reminding me to value all of them ( even the many many dirty diapers. You never cease to amaze me.. Another beautiful, thoughtful , wise and important post!! My current “signs of life” are baseball stuff everywhere! Between baseball bags, equipment, cleats, water bottles, and uniforms (being washed for one kid or the other basically everyday! ), it’s everywhere you look. And when they aren’t doing that, it’s Nerf guns and Nerf bullets everywhere! (Can you tell I have boys??) But, I wouldn’t trade it for the world as they are growing up much too fast! Monica! Amen and yes! This is my favorite post yet. The truth in these words are powerful and life giving and wise beyond wise. Love you friend!!! Love that you are seeing the beautiful mess of life that you have …I am now an empty-nester, and struggle so much with the loneliness and quiet. I would do anything if I could go back to those years of raising my boys. Enjoy your moment!!! 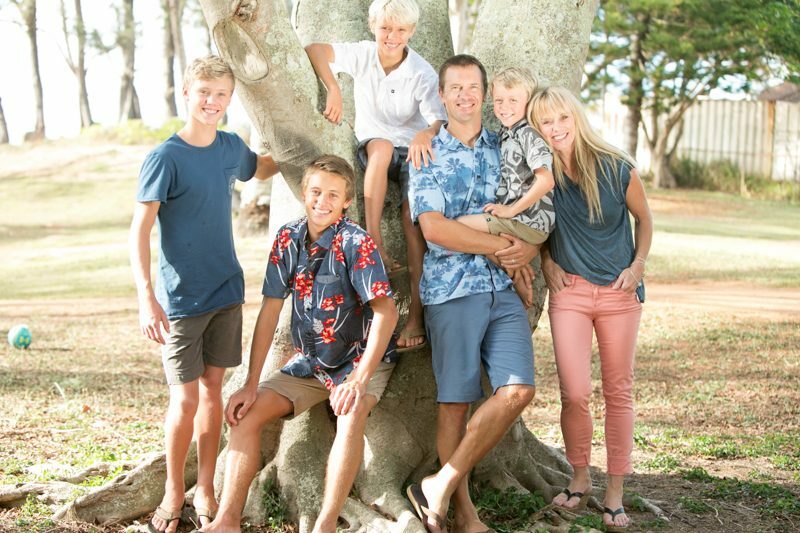 I was on the North shore a few days ago and watched a photo shoot of a family that looked just like yours…perhaps it was you??!! Yes!!! My son and his bride were taking surf lessons from JACY, who works for Steve at Sea and Board Sports. I was sitting on the other side where they entered the water and watched, wondering if it could possibly be you, as I recognized your blonde hair and handsome boys! I “should have” walked over to say hello….sigh…so sad I didn’t. I wasn’t sure it was you and didn’t want to intrude. I printed off all of the information you have on your blog about places to eat, shop, surf etc and carried it around with me! Maybe I’ll see you in San Diego one day! Thanks for responding…love your blog and recommend it to lots of young Moms. I cried and for many reasons when I read your story. An abridged version of our story… I had specifically looked for a home (it took me 5 years) that had enough land to give my kids a country living. We live in a city and I run a daycare/preschool so finally I found a bit of land surrounded by small farm houses. It’s next to a park, tennis courts etc. ; we put 2 trampolines, tether ball, skate ramp, lacrosse nets; gameroom with pool table , darts etc, so our kids could play at whatever they wanted and had room to run. So I suggested to my son’s lacrosse team of parents to host an end of season party here; he told me that he was embarrassed and didn’t want it here; I was mortified! He also doesn’t want his rich girlfriend to come over. We are not fancy or rich but wow it gave me new feelings. I am sad for teenagers who feel like that and for kids who see only fame and rich as the only way to be; I am most certainly going to have my teenager read this. I am certain that when he gets older it will be appreciated; just wish they’d take advantage of it now. Thank you for this today! I really needed your perspective-changing words. Oh, I SO needed this today! Thanks for giving me a new perspective for today, and moving forward. Love this and so needed to hear this! I agree 100%. This is life and some day we will miss the mess and the chaos…thank you for this…..making my husband read this! Wow….thanks for that “pick me up”!! I needed it today! I, as you have shared have a very busy household, with 4 children, husband, work, and a sister that I am caring for during chemo/radiation treatment. (twice a day!!) So, yes, I looked around my home and found a colossal trail of all the busy-ness in my home and found it overwhelming and irritating!! But you reminded me that these days will not be here forever…………..breathe-in, breathe-out, and ENJOY!! Thank you, Monica, for this sweet reminder. Monica, we must be kindred spirits! As a homeschool mama of 4 healthy, active and fun boys (17-9yo), I, too, see many ‘signs of life’ …here in the Midwest! Our signs (this morning) come from a very busy lacrosse weekend. Equipment and gear are everywhere. Especially, protective cups! What is that about?! I often tease my 14yo apologizing for trying to use his equipment room as a dining room😉 I’ve seen plenty of home magazines but have yet to see lax sticks in the corners as decor. So, this blog came at a great time for me, to remember how extremely blessed I am to see these signs of life! Thank you! It IS a choice and something that needs practice, to hang onto wisdom, every day. Thank you Monica, this was just what I needed to hear today! Your words always encourage me! So as I was reading this post my husband was out picking up our kids from basketball training when I get a txt saying he was just about home when they realised that our daughter had left her school bag at training (only an hour round trip) – I’ll show him this post when he gets home to remind him this is our “life” lol!!! !